Published: Aug 10, 2007 to ? The hapless hero of Nyankoi! is Junpei Kosaka, a guy who not only hates cats, he's deathly allergic to them. So it's kind of bummer that he has a crush on a classmate who adores kitties, and things go from bad to worse when he accidentally angers a guardian deity of cats who bestows upon him a gift and a curse. He can now understand what cats say, but he must grant 100 wishes from cats or he'll be turned into a cat himself! Nyan Koi! 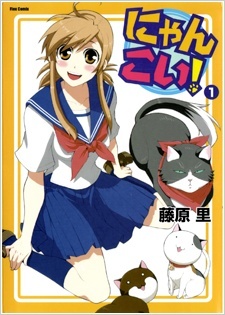 had one volume published in English by CMX Manga on July 13, 2010 before the publisher went defunct. If you like harem, comedy, romace, and cats...look no further! Nyan Koi! is a well made and very, very worthwhile read. It combines the elements of romance, comedy and harem into one funny and interesting masterpeice. The story is good, not complex and is intriguing as it is never boring. The artwork is good and it also helps the manga stay afloat. Besides that, the characters are a lively bunch as they are a combination of your typical school life characters but with their own unique factors which make them stand out. The comedy factor is also there and is very funny. And one more thing... IT HAS CATS IN IT! So if you are a cat lover (like yours truly) there is no doubt you will fall in love with it. Overall, Nyan Koi! is a one of a kind manga and it certainly has potential to be excellent. On a side note, check out the anime as well. Whta happened to the author of Nyan Koi! ?